Published by almostaghost on December 4, 2011 in almostaghost and review. 0 Comments Tags: 2011, 2011 countdown, California, San Francisco, Vetiver. Choruses are a big part of songwriting. They don’t necessarily have to be big anthems, or easy to sing-along to, or anything like that. They come in all sorts of forms, providing familiarity to your ear, and something for the verses to build towards. It, then, takes quite a great deal of confidence to write an entire album with no discernible choruses, a tactic songwriter Andy Cabic has made a habit with all of Vetiver’s albums. Their newest album, The Errant Charm continues this trend. His songs are the general down-on-your-luck folk meanderings that can sometimes feel commonplace, but done with a simple ease. 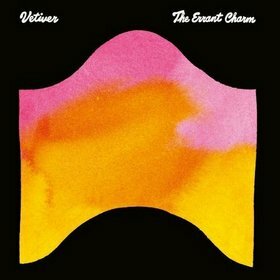 Listening through some of Vetiver older songs, they are really good, but did not have the natural flow that rides through these new songs of The Errant Charm. Belying this apparent songwriting confidence, though, is Cabic’s hushed, inward lead vocals (a strange but likable change over older Vetiver songs, where he often sang pretty clearly). “Can’t You Tell,” for instance, starts out with a throbbing bass beat, which gives way to Cabic singing something vague and unintelligible. All I can make out is a few words here and there, before he asks, “I’m good / can’t you tell?” More words than that are certainly unnecessary. “Fog Emotion” makes this fuzziness explicit, singing of foggy days when “my mind takes a turn back to you.” He’s haunted by a loss, confused and unclear and wondering what is happening. A lot of questions jump out — “when is this old world gonna treat me kind?” By the final song, “Soft Glass,” it feels like his vocals are disappearing entirely under the weight of emotion. There is a couple of clunker songs on here; but for the most part everything blurs together beautifully: his whispers, shimmering slide guitar, crystal-clear acoustic guitar, slightly-odd rhythm, breezy organ, and, what surely can only be referred to as the accidental charm of these songs.